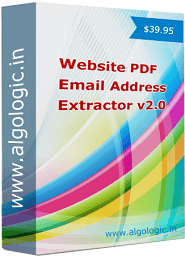 Web PDF Files Email Extractor v2.0 is a software utility to extract email addresses from PDF files from website-internet. 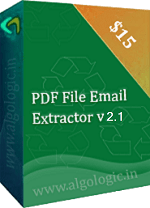 Web PDF Email Extractor v2.0 is a website PDF searching and email extractor tool which search all pdf files recursively in the given list of website urls and webpage links found in the urls. It skip all non required and blocked website urls from search to work much faster. It download all pdf files and extract all email addresses from all found pdf files. Web PDF Email Extractor v2.0 allows you to add website urls from .txt, .html, .csv, .xml files and urls parsing level can be set for searching pdf files and extract email addresses from pdf files. It is the powerful and fast email address extractor utility to extract email address PDF files from internet. Extracted email addresses can be saved in .CSV (OPEN IN EXCEL) and .TXT (OPEN IN NOTEPAD). 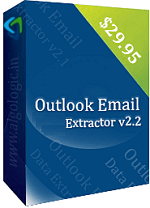 Web PDF Email Extractor v2.0 is available for free trial download for windows platform. Thunderbird Email Address Extractor v2.0.7 is a best software to extract email addresses from Thunderbird. It extract emails from any mail folders and from recipient, bcc, cc, sender, subject and body of emails.